Helen Sloane's diary, is the hilarious first novel from the ever popular Jeff Lucas. In this page turning read, when things aren't going well on Helen's mission to help the young people in her town, help arrives from an unexpected quarter. Corruption, chaos, passion, laughter, tears and thought provoking lines make this book a hilarious and poignant read. 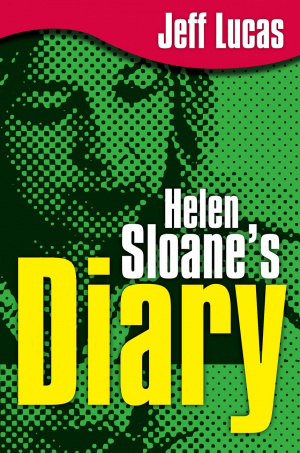 Helen Sloane's Diary by Jeff Lucas was published by Authentic in April 2008 and is our 13572nd best seller. The ISBN for Helen Sloane's Diary is 9781850787976. Was this going to be a girly book? It was written by a man, so I had to see. I was soon deep into the story and surprised myself at how involved I felt with the main character, Helen herself. Jeff Lucas acknowledges the help of Tamsin Kendrick who enabled him to write very believably as a twenty-something young woman. I smiled, worried and enjoyed my way through and found myself pondering at the end. You can read it at a superficial level and just enjoy it, or you can think about what you are reading more deeply, and realise that there is a lot to learn from the diary, while still enjoying the read. To make the point that this is not just for girls and women, Authentic have published the title with this alternative cover to the pink, and a different ISBN. Jeff Lucas is not so much a Christian writer as a Christian comedian who writes, and his famous wit is used to great effect in this diary of a confused 27 year old. It's basically a Christian version of Bridget Jones' diary, and poor Helen has to struggle not only with a number of unsuitable men, but also with her relationship with God, with her agnostic mother, and with some seriously nasty people in her church. The voice of a middle aged man does occasionally slip through, but for the most part Helen is very convincing, and you start to really care about her life. Got a question? No problem! Just click here to ask us about Helen Sloane's Diary.